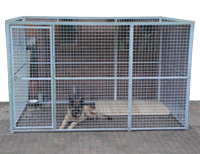 We manufacture and distribute an extensive range of steel panel roofless kennels for both domestic and commercial use. Our roofless kennels can be used as a stand alone outdoor kennel or used in conjunction with an existing kennel to help keep your animal within a certain area. All our steel panels are fully hot dip galvanised, meaning they are safe for application both indoors and outdoors and require no maintenance at all. If you want a particular shape or size kennel or panel that is not listed below, please do not hesitate to contact us for a free quotation.